Discuss the Declaration of Independence. Why was it written? What meaning did it have in 1776? What meaning does it have today? Read the Declaration of Independence and highlight words and phrases that stand out to you. Read over the words and phrases you highlighted. In what ways does the language you selected help to clarify or distill the meaning of the Declaration of Independence for you? Read over the words and phrases you highlighted again. In what other context of your life might these words and phrases have meaning? 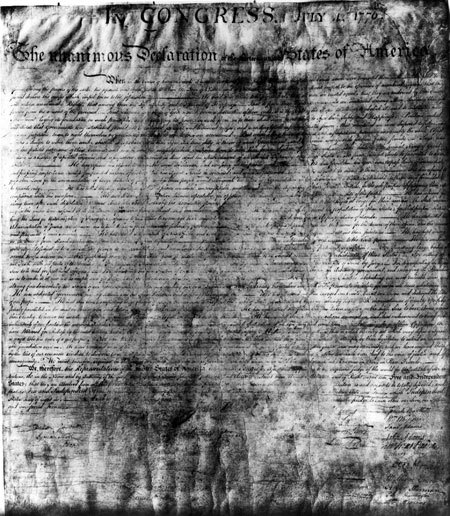 How else does this founding document speak to you? Note some ideas. Read the poem “Declaration” by Library of Congress poet laureate Tracy K. Smith. After, jot down your first impressions of the poem, it’s meaning, and what it made you think and feel. Next, listen to Smith as she discusses “Declaration” with The New Yorker (begin at 8 minutes and finish at 11:25). Now listen to Smith recite “Declaration”. Describe your reaction to the poem. How did the interview and recitation change your first impressions of the poem? What new thoughts and feelings do you have? Now continue to listen to Smith’s interview with The New Yorker (from 11:55 to 13:42) to hear what she says about the meaning of erasure “as a process and a poetic technique”, particularly when used with historical documents. Review the words and phrases from the Declaration of Independence that you highlighted earlier and your ideas about its meaning for you today. Then create your own Declaration erasure poem that speaks to your thoughts, feelings, and experiences, giving careful consideration of language and tone.